Artur Atoyan, the head of the Union of Armenian Fish Producers and Fish Exporters NGO, said that since the beginning of the year, a total of 25 fisheries have already closed down, and in the last three days three more companies joined them. According to the forecasts of the Union’s head, at the end of fall, 35-40 companies may also close down due to the risky period. “In May, a decline starts in this field. During warmer months, the demand for fish decreases. From the summer season to fall the price of fish is declining. This is the most risky period for the sector. If we enter the risk zone with already negative results, the more companies will close down,” said Atoyan. Haykaz Zeynalyan, who got engaged in fish production in 2009, gives assurances that fish production in Armenia is not a profitable business. “We mostly exported to Russia, where prices are such that it is not profitable for exporters. Fish farming stagnates, prices fall. Here, fish prices are also falling. The industry’s man suggests that at least the interest rates for those companies that have already taken loans be lowered and that water tariffs not be raised. In 2015, a U.S. government-funded program was launched aiming at complex preservation of resources by cooperation and use of advanced scientific technologies. The program stipulates that new technologies should be introduced in fish farms and water resources should be duly managed. Atoyan says that within the program issues of fish production have repeatedly been raised, but so many problems have accumulated over the years that they can’t have any success. According to him, the Ministry of Agriculture announces that there is progress. “But if that is the case, then why more and more fish farms keep closing down?” he queries. “They say that it is due to the economic crisis in the country. It is also wrong. This is a way to self-defense from domestic fish producers, who actually promote the country’s economic development. Fish farming in the Ararat plain is gradually disappearing. We have sent 18 letters to the Ministry, but our demands have not been met. A reason has been brought that they are not grounded,” says Atoyan. Meanwhile, Tigran Aleksanyan, the head of the Fishing Industry and Beekeeping Department at the Ministry of Agriculture, told armradio.am that in the first four months of the year the volume of fish production and fish export increased by 100 tons, compared to the same period of last year. They export mainly to Russia, Georgia, and Ukraine. They also started to export to Central Asian countries. “About 70 farms have received permission to export to the Eurasian Economic Union [Russia, Belarus, Kazakhstan, Kyrgyzstan] countries. 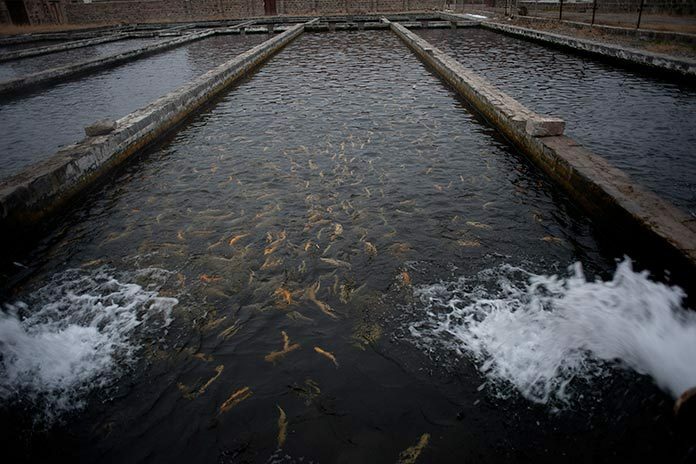 Fish farms are gradually introducing modern technologies. There is no such widespread phenomenon of continuous closing down of fish farms. Of course, there are a certain number of fisheries that have closed down, but simultaneously there are also some which have been opened. There is no danger of monopolization in this industry. Today, we are working with almost everyone,” said the Ministry official.